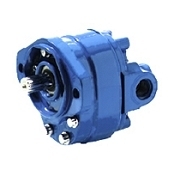 The 21300 series gear motors are capable of producing up to 462 in-lb of torque at 3000 RPM. They come in a variety of frame sizes and speeds. Eaton Hydraulics is a worldwide leader in the design, manufacture and distribution of a comprehensive line of reliable, high-efficiency hydraulic systems and components. (For specific product information, check out our on-line product catalogs). Major markets include agriculture, construction, industrial, mining, marine and lawn & garden. Backed by the most extensive distributor network in the fluid power industry, Eaton Hydraulics designs, manufactures and globally markets a complete line of reliable, high-efficiency hydraulic components. To serve its global customers the Eaton Hydraulics has manufacturing plants in the United States, Europe, India, Japan and China; sales offices in, Europe, China, Japan, Korea, Singapore and Australia , as well as the most extensive distributor network in the fluid power industry. Headquarters are located in Eden Prairie, Minnesota. Eaton Corporation is a diversified industrial manufacturer with 2005 sales of $11.1 billion. Eaton is a global leader in electrical systems and components for power quality, distribution and control; fluid power systems and services for industrial, mobile and aircraft equipment; intelligent truck drivetrain systems for safety and fuel economy; and automotive engine air management systems, powertrain solutions and specialty controls for performance, fuel economy and safety. Eaton has 59,000 employees and sells products to customers in more than 125 countries.